Welcome to the Week 15 Tight End Rankings! The tight ends are deep enough where you should be able to find something if you have a need, but I doubt many of you are scrambling, which is why you’re still standing! The elite options are not as strong as they’ve been in recent weeks. Kelce is in a tough matchup. Ertz lost Wentz and Kittle faces the Seahawks. On the plus side, Gronk looked good last week and Jared Cook is closing out his career year strongly. Cook having a career year for THIS Raiders team is peak Cook, btw. In DFS, I am looking hard at Gronk, Brate, Vance McDonald and maybe Evan Engram if OBJ sits out. If I decide to punt, then I really like the Jets Chris Herndon. I’ll get into this a bit more in depth when I post the DFS pod, which may be on Sunday this week due to the Saturday games. Four game days in the next five days, folks. Get ready! All the rankings will be updated before the start fo the Saturday games. 1 Zach Ertz PHI 6.500 PHI@LAR 12/16/2018 08:20PM ET Lost his QB, but still the lead cog in this offense. 2 George Kittle SF 6.300 SEA@SF 12/16/2018 04:05PM ET Tough matchup but no way you sit this guy at this point. 3 Eric Ebron IND 5.900 DAL@IND 12/16/2018 01:00PM ET He keeps finding a way and the target volume is assured. ***UPDATE*** He’s one of the very few healthy weapons they have with Hilton now a potential deactivation. 4 Rob Gronkowski NE 5.800 NE@PIT 12/16/2018 04:25PM ET I’m tempted to put him higher. He played 78 snaps last week with 107 receiving yards and a score. Play Gronk this week. 5 Jared Cook OAK 5.600 OAK@CIN 12/16/2018 01:00PM ET His playing time is back up again. Two straight hundred yard efforts. Have to list him here—even though I hate doing it. 6 Evan Engram NYG 4.100 TEN@NYG 12/16/2018 01:00PM ET Gets a big bump if Beckham sits out. ***UPDATE*** OBJ is indeed OUT. 7 Cameron Brate TB 4.000 TB@BAL 12/16/2018 01:00PM ET Could have a slightly enhanced role this week with the Ravens strength at CB. 8 Vance McDonald PIT 3.900 NE@PIT 12/16/2018 04:25PM ET I like the matchup for him. 9 David Njoku CLE 3.600 CLE@DEN 12/15/2018 08:20PM ET The Broncos give up TE stats, so I’d stick with Njoku here, despite his struggles. 10 Austin Hooper ATL 4.200 ARI@ATL 12/16/2018 01:00PM ET No practice (knee/ankle) but plenty of time to get cleared for Sunday. Have a plan B just in case. Arizona has been stingy with tight ends on the season. ***UPDATE*** He will play through the injuries this week. He is no longer on the injury report. 11 Jimmy Graham GB 3.800 GB@CHI 12/16/2018 01:00PM ET They need him here, so expect a solid target total. 12 Trey Burton CHI 3.700 GB@CHI 12/16/2018 01:00PM ET He fell off the map when Trubisky got hurt and he hasn’t regained his footing yet. He DID have five targets last week so he’s a viable option if you need him. 13 Chris Herndon NYJ 2.900 HOU@NYJ 12/15/2018 04:30PM ET Darnold likes him and it’s a decent matchup for tight ends. 14 C.J. Uzomah CIN 3.600 OAK@CIN 12/16/2018 01:00PM ET Great matchup if you are in need. 15 Ian Thomas CAR 3.400 NO@CAR 12/17/2018 08:15PM ET Tough matchup but he’s viable if you need him. 16 Kyle Rudolph MIN 3.500 MIA@MIN 12/16/2018 01:00PM ET They really ought to use him more, but for now, he’s a reach play if you need him. 17 Vernon Davis WAS 3.200 WAS@JAX 12/16/2018 01:00PM ET Bad matchup but he should get looks with Reed out. 50 Jordan Reed WAS 4.000 WAS@JAX 12/16/2018 01:00PM ET Doubtful with a toe injury. 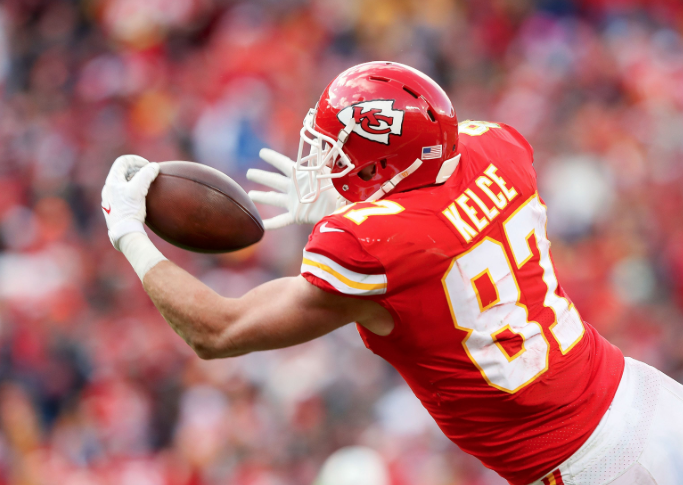 51 Travis Kelce KC 7.400 LAC@KC 12/13/2018 08:20PM ET (ALREADY PLAYED) Tough matchup with Derwin James on him, but he’s still the best option out there…as you’ll see.